Das am Hang gelegene Ferienhaus Villa Belle ist wunderschön gelegen, umgeben von einem üppig bewachsenen, tropischen Garten. Genießen Sie die Aussicht auf Choeng Mon und die Bucht von Plai Laem sowie einen spektakulären Meerblick. Ein wahrlich schöner Rückzugsort für die Gäste, die gerne von der Natur umgeben sind. Das Ferienhaus verfügt über 3 große Schlafzimmer. Die Hauptsuite ist im schwarzen und weißen, minimalistischen Stil eingerichtet und besitzt ein breites Bett sowie einen schwarzen Kronleuchter. Es besitzt ein eigenes, angrenzendes Badezimmer mit Terrazzo-Badewanne und Kerzenlicht. Das private Holzdeck mit gemütlichen Sofas und einer Hängelampe im marokkanischen Stil ist der perfekte Ort zum Entspannen. Die beiden anderen Schlafzimmer sind jeweils mit einem Himmelbett, einer exklusiven Lounge zum Entspannen und einem eigenen, angrenzenden Badezimmer mit eingelassener Terrazzo-Badewanne ausgestattet. Jede Suite bietet eine fantastische Aussicht, an der sich die Gäste erfreuen. Die Wohn- und Essbereiche sind in einem offenen Konzept gestaltet. Die Lounge verfügt über weiche Plüschsessel in weißer Farbe, ein Unterhaltungssystem sowie eine Auswahl an Filmen. Der schicke Essbereich ist mit einem großen, antiken Tisch, der Platz für 8 Personen bietet ausgestattet. Er liegt direkt neben der Gourmet-Küche und einer Frühstücksbar. Im Außenbereich befindet sich ein Infinity-Pool, eine Lounge unter freiem Himmel sowie eine Grillecke. Well I can write this review in a quick summary for those who just want to have a quick read. I will also write a full review too. So in summary, the view from the villa was amazing set in the hill tops, the pictures are slightly older as when we got there it was so much better! From example the second floor had all thick sliding doors that open fully! 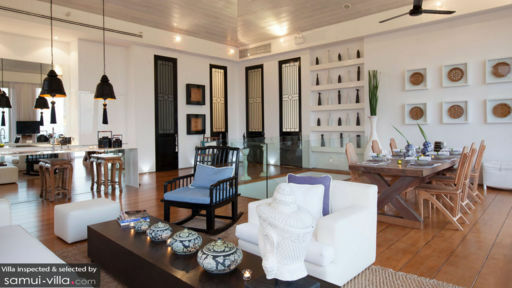 The whole villa was beautifully designed and the decor was well thought out to make it a very stylist villa to stay at. The service from Noom (he is the villa manager there) and Gift (the maid) The chef was 100% flawless. What ever you needed was nothing they couldn't do. The place was kept so clean! The chef cooked us such amazing food that from the 7 days we stayed we only ate out once! She can cook anything you like. The villa has wifi, Apple TV, great music system, great rooms, comfy beds and shower or outside bathtub! 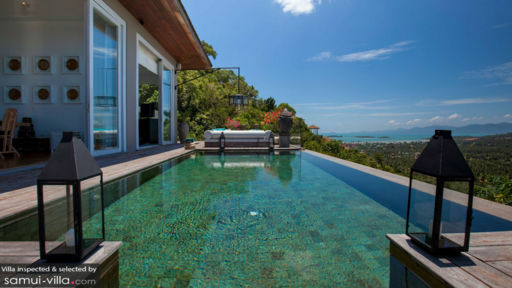 If your thinking of staying in a villa in koh samui then look no where else and stay here, you will not be disappointed. Here is my full review. Upon arrival to Koh Samui my group of 6 was greeted by Noom, 1st impression was very friendly and good English (which helps). After a quick 15min drive from the airport we drove up a very long drive-way and at the top we could see bright lights, driving close we could see the big villa and we was all very impressed! Noom helped us with our bags and then gave us a tour of the villa and showed us how everything worked, for that 10min we was just amazed how the villa looked, tall ceilings, great decor design, very spacious, and that infinity pool over looking that view, wow! we all jumped in that same day we got there. Our whole stay at the villa was one of my best experience as Noom was just great, he was very friendly, the service he provided just made our stay a lot better. Nothing was out of his reach to do for us. He provided us with a phone to use so when we asked to be dropped off down town we can call him to get us back ready for the chef in the villa cooking us dinner. I would highly recommend using the chef services that the villa has to offer as it cost cheaper then eating out, the table was always set out for us and from the big dinner table we had the view to look out from. The food selection was anything from Thai curry, seafood BBQ, steaks anything you desire the chef can cook it. Gift also kept the villa clean and looked after us, making sure we have enough towels and letting us lay in and clean our rooms later. Even when we streamed movies to the Apple TV provided to watch a movie Gift would always attend to our needs if we wanted a drink. The view from the hill tops is truely amazing, at night it's so peaceful and over looking koh samui. The infinity pool was a great size and even with all 6 of us in there was still enough room if you just wanted to do a few lengths of swim. Outdoor speakers was great too. Our whole experience in the villa was very enjoyable and if you asked me the question of would I stay here again? The answer will be HELL YEAH, I'm already planning to take my parents and family there now next year or so. Our family 5 adults and two almost grown children have booked the Villa Belle for 15 days. It was absolutely amazing what we have found here. 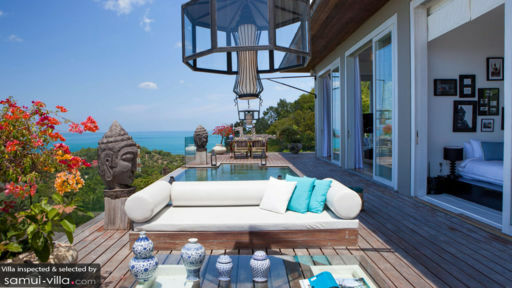 We've been over 20 times on Koh Samui, and have lived in some beautiful accommodation! But this house is really something special. Our second visit! Just returned from a magical week at beautiful, luxurious, elegant Villa Belle, the best villa in the world. We spent a relaxing time with delicious meals, perfect swimming, fun shopping, and long nights of undisturbed sleep in the high-ceilinged spacious bedrooms. The Villa Belle is a magic place, and I dare to say you will feel that the villa is your home whenever you are in there or leave there. We'd love to give a special thanks to Noon,who work in the Villa Belle and made our vacation/wedding wonderful. (yes, we have a wedding reception during the time we stay in villa.) That was a perfect memory for all members of my family!